10 players in World Cup history have won the Champions League and World Cup in the same year. 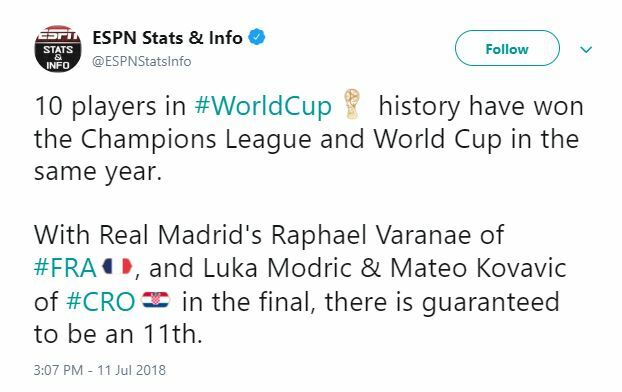 With Real Madrid's Raphael Varanae of France, and Luka Modric & Mateo Kovavic of Croatia in the final, there is guaranteed to be an 11th. So, who are the 10 players who have achieved this feat previously? Also, how many and who are the players that have won Copa Libertadores and a World Cup in same year? Not the answer you're looking for? Browse other questions tagged football trivia world-cup champions-league copa-libertadores or ask your own question. How to find “distance covered” for players during the World Cup? How many times two teams from the same continent have played the World Cup Final game? Have two teams ever played each other twice in the same world cup? Has any FIFA World Cup winner ever had all their knockout stage matches won in extra time/penalties?